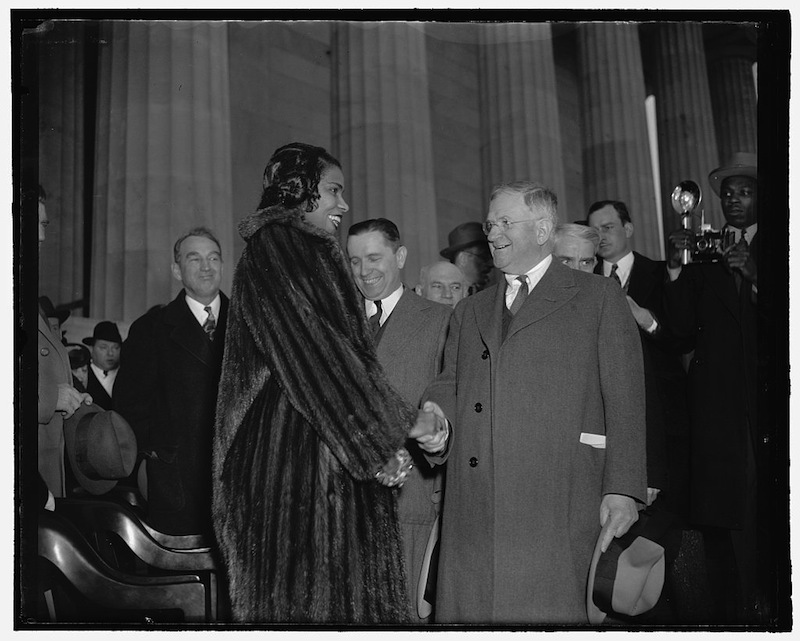 Marian Anderson, “Marian Anderson,” Histories of the National Mall, accessed April 23, 2019, http://mallhistory.org/items/show/76. Marian Anderson was an African American singer, who became famous for fighting racial inequality when she gave a concert on the steps of the Lincoln Memorial. In April 1939, the Daughters of the American Revolution refused to allow Anderson to sing to an integrated audience at their Constitution Hall. With help from First Lady Eleanor Roosevelt, the concert was moved to the Lincoln Memorial. Anderson stood on the steps and performed before 75,000 people gathered on the Mall. Millions more listened to her on the radio. Her concert pointed to the value of using the National Mall as a place to bring public attention to political and social issues. Born in Philadelphia, Pennsylvania, Marian Anderson began singing in her church choir when she was only 6 years old. Nicknamed "the Baby Contralto," she was invited to sing in churches throughout Philadelphia. She began voice lessons when she was 15 with Mary Saunders Patterson, a prominent black soprano. As she continued with her musical training, invitations to sing gradually grew into concert tours throughout the American south. In 1928, she performed a solo recital in New York's Carnegie Hall. Anderson spent time training and singing in Europe, where she was given scholarships to fund her musical career. She broadened her operatic repertoire, improved her French, Italian, and German. In the US, legal racial discrimination prevented Anderson's musical career from blossoming in the same way it had in Europe. In 1955, after performing for years with prominent American and European musical ensembles, the New York Metropolitan Opera invited her to sing a major role in Giuseppe Verdi's "Un Ballo in Maschera." Her performance marked the first time an African American opera singer appeared as a member of the opera company. Anderson was awarded the Presidential Medal of Freedom in 1963. On Easter Sunday in 1965, Anderson gave her final concert at Carnegie Hall, following a year-long farewell tour. She received the Kennedy Center Honors in 1978 and the National Medal of Arts in 1986. Two years before she died, she was given a Grammy Lifetime Achievement Award.